Grove squirrels are well known on campus, so why shouldn't they be our mascot? With a history of mascot changes, albeit settled, I think there is one more critter that should have a fair shot of being considered mascot. 2. They eat like us. Have you ever seen a squirrel on campus turn down a fry? What about a bagel crumb? Now, have you ever seen a college student turn down Starbucks? What about Insomnia? I rest my case. 3. We sort things out the same way. Have you ever seen a college student ramble through laundry looking for a specific shirt because no other shirt will do? Now, how you ever seen a Grove squirrel chuck through trash? The resemblance is uncanny. Okay, flying squirrels sound cool. It may or may not be borderline an oxymoron, but still, it's an actual thing. A land shark? No logical basis. 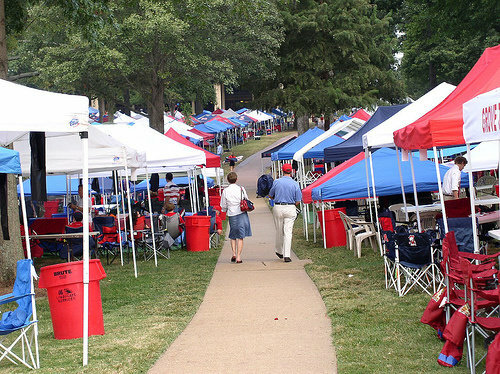 Can you imagine a sea of people wearing squirrel shirts in the Grove? Imagine school recruiters handing out squirrel themed merch. Think of the pens. Fluffy tailed pens. College students are always looking. Whether it's for our next meal, the assignment we swore we printed out, or a sense of purpose. We are usually looking and seeking for something. Have you seen those little things frantically scrambling around from trashcan to trashcan? That is each of us at one point or another. They understand us more than a silly shark ever could. There is an old wive's tale that declares walking in the path of a squirrel leads to good luck. Walking in the pathway of a shark is unlikely and swimming in the way of a shark typically does not lead to good luck. Squirrels move around frantically as if they forgot where they need to be. That is you when you forget your Tuesday lab. You're a squirrel. Everyone on campus has a squirrel story. Whether it's from recording a friend's close interaction with one and posting it with the caption "The Squirrel Whisperer" or getting an entire fry from Cane's stolen by the tiny bandits, we all have one. A shark story? That's one for the news. The heart of campus is nearly a dozen acres of beautiful nature. Squirrels will always be a part of that. Even if we don't agree that squirrels are a better mascot, I hope we can all agree that sharks should not be apart of our tailgating activities. Finals week, also known as the worst week of college for every student. Every student scrambles to try and learn and review a whole semester worth of information for a single test that could make or break their grade. Yes, it is just as stressful as everyone says it is. Instead of giving you tips on how to get through it, I'm going to give you one of the most important one of them all: absolutely do not step foot into a library. 1. The library will be beyond packed. In college, you have the students that practically live at the library, and then you have the students that only go during finals week. During this one stressful week, everyone decides that they will be productive and go to the library to study. Because basically everyone thinks this way, it is always beyond packed, therefore making it extremely difficult to find a seat. The weekend leading into finals, last semester, I got to the library at 9 a.m. just so I could get a table. I'm already stressed enough as it is during this week. There is no reason for me to add to this stress by worrying about whether or not I will be able to find a table. 2. It is never quiet. Because there are so many people going to the library during this one crucial week, it is extra loud. It may be different for every school, but at Florida State, as you go up each floor it gets quieter. The first and second floors are always the loudest because that's where most people are. But since there is a major increase in attendance, every floor suddenly becomes the loud floor. This makes going to the library counteractive because you will probably not get any studying done with all the noise distracting you. 3. You will run into literally every single person you know. FSU's campus is already compact enough that I run into people I know everywhere I go. But the second I step foot into Strozier, I instantly run into someone I know. Luckily for me, I love running into people I know but I know plenty of people that don't. For someone like me, it turns my productiveness into unproductiveness because I'm too busy talking. For the opposite, it makes them uncomfortable. This week many people dress as comfortable as they can and don't care too much about their appearance which leads to these kinds of people feeling stressed about who they might possibly see. 4. It can be very distracting. I love people watching. Seeing people walking around the library is just so entertaining to me. But this is only a distraction for me. There are so many people coming and going. Every time I hear someone's footsteps, I always have to pick my head up and see who they are. With so much looking, I get nothing done. Because of this, I tend to sit in towards the back in the more closed off spaces are so I don't get too distracted. 5. There are so many other places that you can go study at. This is a college campus. The whole point in coming to coming is to get a degree. You can make anywhere your study spot. There are also many places to study. There's a study room on every floor of every dorm, many tables outside in front of many of the buildings, and areas in different classroom buildings that you can use as a study space. These are just a few of the many options on campus. If there are so many options, why would I even consider going to the library? I hope that I have convinced you all to never step foot in a college library during finals week. Let your mind at (some) ease, and find another place to study. Happy studying and good luck on finals!